Timberland has built something of an oxymoron with something they call the ultimate "light heavyweight" boot. The Timberland PRO Helix 85594 boot uses a lightweight safety toe that is made of alloy instead of steel, thus giving users the protection they need without all of the weight. Part of this heavyweight status can also be attributed to their use of a rugged full-grain waterproof leather shell. While the Helix is technically classified as a work boot, Timberland also took a few cues from their outdoor boots and incorporated an anti-fatigue energy boosting technology that is designed to absorb shock and return energy to key areas of the foot. The sole of the boot also looks a bit like something you would find on a hiker, yet it still has the slip, oil, and abrasion resistance of a work boot. Since I use my current work boots as hikers, these features sound like a plus. 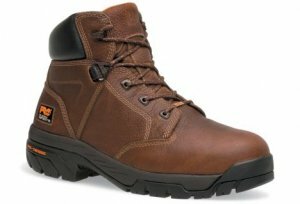 The 85594 PRO Helix Boot has an MSRP of $160 and is available online and in stores now.